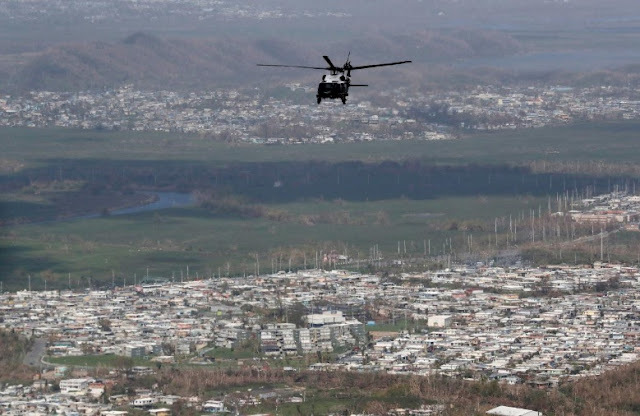 U.S. President Donald Trump, flying aboard the Marine One helicopter, makes an aerial tour of hurricane Maria storm damage around San Juan, Puerto Rico, U.S. October 3, 2017. The price of Puerto Rico’s benchmark general obligation bonds tumbled to a record low on Wednesday after U.S. President Donald Trump suggested the island’s massive debt load will have to be wiped out due to the devastation caused by Hurricane Maria. The bond due in July 2035 74514LE86=MSRB, the island’s most recent benchmark debt issue, dropped by 12 cents to 32 cents on the dollar early on Wednesday. Trading volumes jumped following Trump’s comments. The bond has tumbled by more than 25 cents on the dollar since Hurricane Maria devastated the U.S. territory last month. The bonds are thinly traded given they are in default, and behave more like an equity as no change in yield accompanies their price movements. They carry a coupon of 8 percent. In May, Puerto Rico filed a form of bankruptcy under the federal 2016 rescue law known as PROMESA. The island’s capital structure has 18 public agencies owing a combined $120 billion in bond and pension debt. Hurricane Maria knocked out power to the island’s 3.4 million residents, devastating the already dilapidated electric power infrastructure. The Puerto Rico Electric Power Authority declared bankruptcy under PROMESA in July. “We are going to get the electric going again. You know, that was a complete wipeout,” Trump told Fox.